Here’s the BudyPhones Play review. Are these wireless headphones safe for small kids and build to last? If you’re looking for wireless Bluetooth headphones for kids (with volume limiter) than BuddyPhones Play are one of the best options. 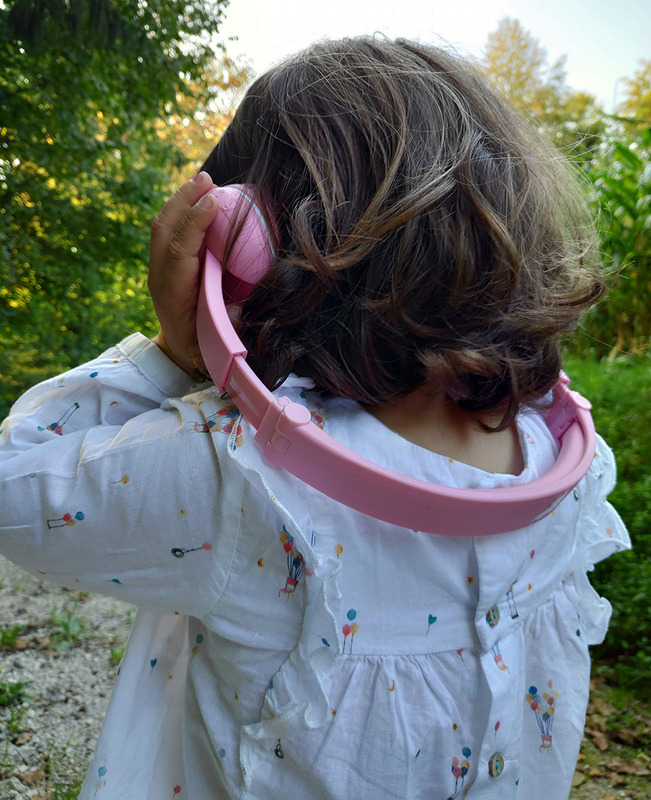 The company has made many different kids headphones, and these have more features than most. In a way, these are the premium kids cans. They are durable, colorful, and entirely safe even for little kids. Check below for additional features and whether or not these are suitable for your little one. The headphones come in a fancy box. Looking pretty good on a 3-year old. 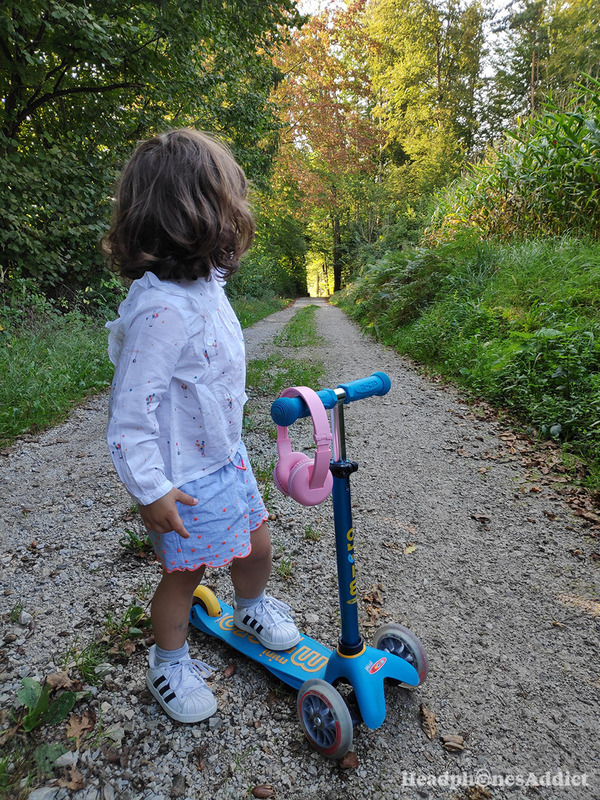 In our test we gave them to a 3-year old girl who had no complaints about comfort, though to be fair, she didn’t wear them for long since kids get distracted fast. And, since the headphones are super flexible, they can fit on an adult’s head as well. So, we tried them ourselves, and surprisingly they’re quite comfortable, comfier than many adult on-ear headphones. The clamping force isn’t too strong, so the ears don’t get irritated. And when the kids grow, you can extend the headband to fit their bigger head size. Also, the earpads have soft padding which doesn’t rub against the skin in a wrong way. It’s an excellent product from Onanoff. 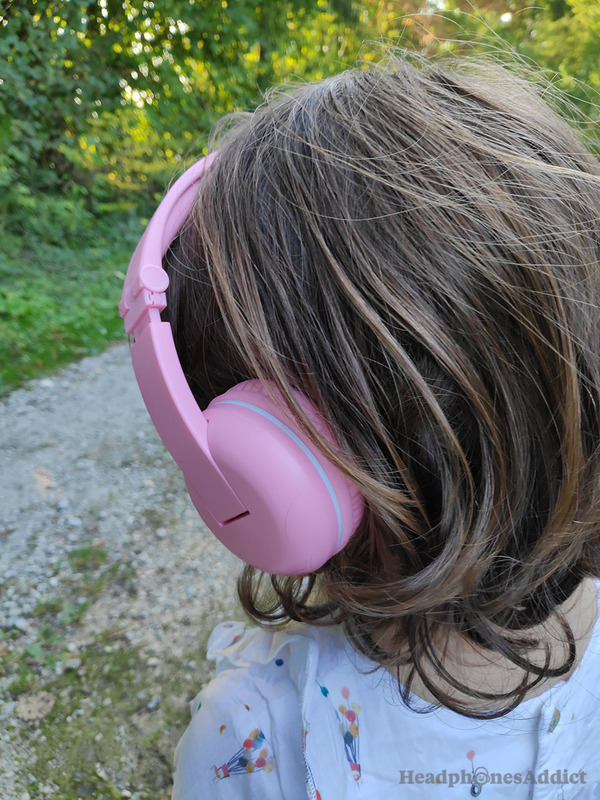 It has a premium feel to it, and it’s a bit surprising headphones for kids can be this good. Now it’s hard to say what kind of noise isolation is best for a pair of kids headphones. If it’s bad, the kids might want to crank up the volume which leads to hearing loss. But if it’s too good then it’s hard to hear when you’re parents are calling for you (which can get the kid in all kinds of trouble). Anyway, since the headphones already have a volume limiter which protects against hearing damage, effective noise isolation isn’t that important (noise exposure is controlled by the limiter). And that’s exactly what they’ve done with BuddyPhones Play. Passive sound isolation isn’t that effective, and that’s fine. The background noise is somewhat lowered but only minimally. It means the kids will be able to hear you even when they’re listening to music or watching an educational video. Making these kids headphones wireless was a smart move. We all know how kids are with wires. Even if they don’t want to break stuff, they get their clumsy moments, and it happens. Now, connecting to a Bluetooth device (a smartphone in our case) is simple and straightforward. It uses the same Bluetooth as adult headphones, so you’re getting the same functionality. The range of connection is standard 30ft (10m) which is average for Bluetooth technology, and it’s the same as in any pair of headphones for big people. When it comes to connecting for the first time, you’ll probably need to help your kid, even though you just press and hold the power button and find the device. If your kid is a bit older, you might show him or her how to do it on their own. Anyways, once you’re connected for the first time, and your smartphone remembers the headphones, they get automatically connected when turned on. On a full charge, the battery lasts up to the promised 14 hours. Now, it depends on how long ago the battery was charged and how loud the headphones are, but generally, you won’t have to charge them too often. The micro-USB charging cable is in the package, and it’s as easy as connecting them. In case you run out of battery life, you can use them corded ( with the included 3.5mm cable) which is always handy. Just by looking at them you might think they’re poorly built and the colorful plastic can’t really give protection. But, that’s not the case. In fact, they feel sturdy and well made. The headband is flexible (and foldable), so it doesn’t get damaged if the kids throw them around. Parts are well put together, and overall the headphones give a positive impression about durability. The only weak points we see is the detachable cable. Cables are prone to breaking, but since these are wireless, that’s no such a huge issue. A bigger potential problem might be water. Kids aren’t cautious with things, and water is a big enemy of headphones, including BuddyPhones Play which aren’t waterproof. Nonetheless, you get a 2-year warranty that the headphones will work as intended which is plenty knowing the end users are little people who are experts at breaking things. Their color makes youngsters go crazy (not really, just a funny shot). The detachable cable comes with an in-line microphone and an audio adapter for sharing the music. It can fit 1 additional headphone jack, but if all the kids have the same cable, it can supposedly fit up to 4 children (though we didn’t test this). You also get a built-in microphone (works in wireless mode) and controls for skipping songs and managing volume. You can choose from 3 presets of the volume limiter. Now, the most important feature that makes these headphones different and suitable for little kids is the volume limiter. You get 3 presets, limited to 75 dB, 85 dB, and 94 dB (decibels). The difference in maximum volume is quite noticeable and somewhat silent for an adult, which is a good thing. You can also set them to Study Mode (only at 94dB) which increases voice clarity and volume, so the kids hear you better. It’s a proprietary technology you can’t find in other headphones. Is it useful? Maybe, in some specific situations. Are they active noise cancelling? No. There’s no point in putting ANC into kids headphones because that would only increase costs and not make any real difference for the youngsters. The headphones come in different colors and also come with a set of stickers. It’s a nice selection, and your kid can customize his or her headphones to their liking. It makes them more fun and easier for kids to accept headphones as their own (hopefully they don’t figure out big headphone get louder). Additionally, you get a soft fabric carrying bag in the same color as the headphones for easy storage. And, a micro-USB charging cable but that’s a necessity. How is the sound quality in general? It’s not super bad as you might expect. There’s an emphasis on bass which can get quite powerful. It’s probably what kids prefer. Thankfully they can’t crank it up too loud to damage their hearing (which leads to hearing loss). We’ll not go into details about the audio quality, the soundstage, and the timbre because kids can’t fully appreciate it yet. 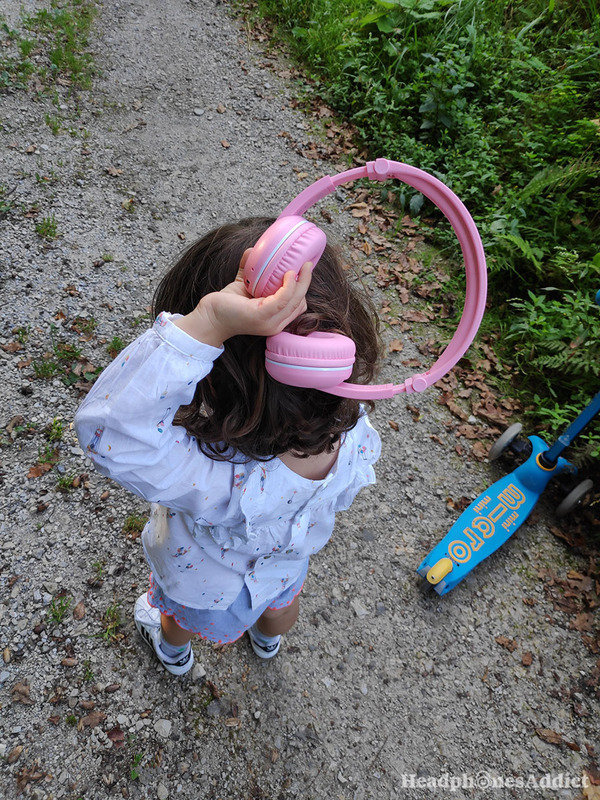 But it’s better than you’d expect from headphones for kids. It’s perfect for music and videos with good clarity. And, that’s the most kids will ever need. If we had to create premium headphones for children, we’d make them the same way. It’s everything, and more kids would want, though it comes with a slightly higher price (we think it’s worth it, safety first). 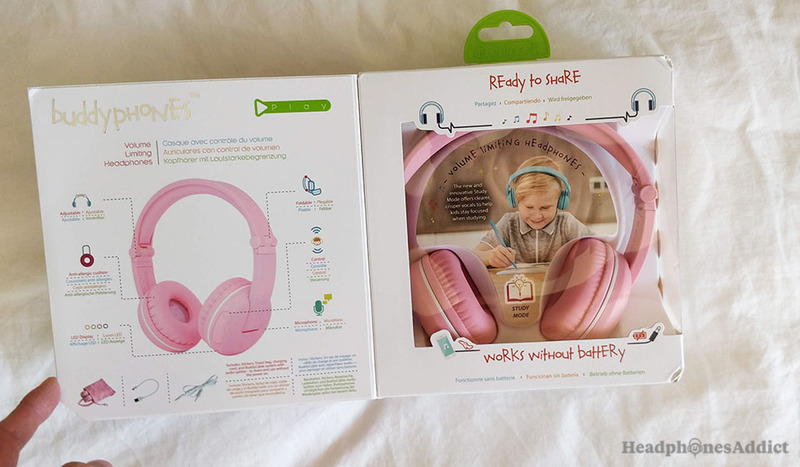 So, if you’re looking for durable, wireless headphones for kids (3 years old+) with an effective volume limiter, then BuddyPhones Play are one of your best options. Check other kids headphones here.